IT SEEMED AS IF Jet Mail had cheated death. Two and a half years ago, with its prime retail space at 2130 Fillmore coveted by the onrush of fashion boutiques eager and able to pay far higher rent, the packaging and mailing store moved south to 2184 Sutter. In the process, they sparked new life on a sleepy stretch of Sutter Street. Now the gig is up. 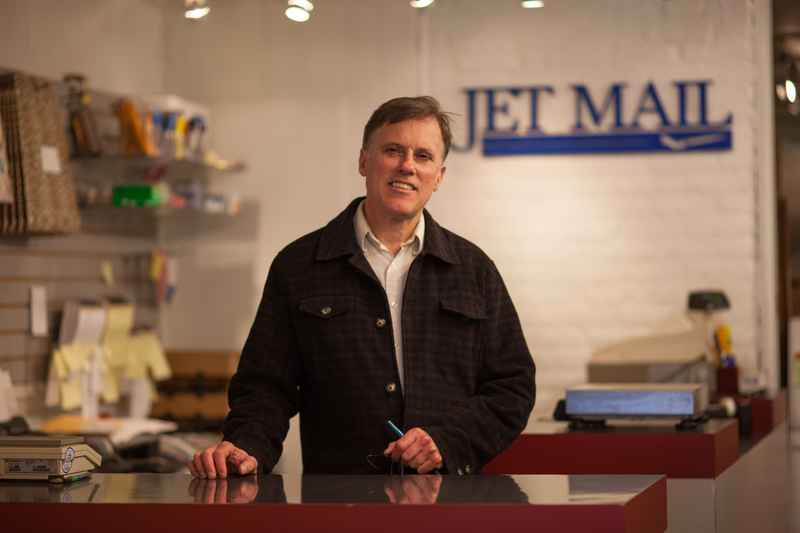 Jet Mail will go out of business on September 15, ending a 25-year run in the neighborhood. The space will become an insurance office. Though owners Ed Tinsley and Kevin Wolohan had a five year lease, with an option to renew for five more — and though they had successfully re-established the business in its new location — they got notice in April their space would be sold and that a provision in the lease required them to vacate. “First I knew about it,” said Tinsley. He said the provision was inserted into the lease at the last minute and that neither he nor Wolohan knew it was there. After finding they had no good options, they decided to shut down and not start over a third time. The individuals and businesses renting their 300 mailboxes were told to find a new address. Isabelle McGee opened Regard, her striking interior design studio and showroom, next door to Jet Mail. McGee has teamed up with Maryam Zadeh, owner of Copy.net, to throw a farewell party for Jet Mail’s three-person staff on September 10 from 5 to 7 p.m. on the sidewalk in front of their stores. By the end of August, Jet Mail was already a shadow of its former self. Many of the supplies were gone, and the mail was being kept in the back in carefully numbered and labeled FedEx envelopes. “Somebody wants to buy our mailboxes,” said Tinsley, inviting his longtime customers to turn in their mailbox keys. He said most of the fixtures and supplies were going to other packaging stores. Tinsley lives in Sacramento and will no longer have to drive to the neighborhood. But it’s a different story for San Francisco native Wolohan, who’s been working at Jet Mail for 20 years, and haunting Fillmore Street and its environs much longer. “In the ’70s, we’d get a greasy hamburger at the New Asia Cafe” — now the Elite Cafe — “and then hit the consignment shops,” he recalled. He remained in his family home, devoted to the care of his mother, until she died earlier this year. This month he’s doing double duty, shutting down both his business and his family home. He’s relocating to San Rafael, to be near his brother and sister.